Barrel Staves must cure in the open with good temp and humidity seasonal cycles. A few years ago I read where the wine buyer for a major big box company said, “Wine is just a beverage”. The comment was in response to the fact that the buyer being interviewed did not have wine buying experience. In fact, previously she was an electronics buyer for the company. Even wine drinkers at some point in their wine experiences are intrigued about the complexity of making good wine at any price point; it’s the mystery of wine. I have been guilty on occasion of saying; I almost would rather smell the aromas than drink the wine. Even something seemingly as simple as a cork, tends to constantly undergo new findings about its character. As an aside, cork is from a species of the oak tree. Whether a person is infatuated with wine or not, a casual experience with the product will leave most people amazed about how profoundly complex it is to make good wine; and that too means it is not just a beverage. We all notice the bottle, cork, label and then finally the wine; we rarely think much about what it is that made our favorite wine our favorite. Maybe, just maybe we ought to think about the oak tree. The oak tree, specifically the white oak; French and American, gives wine its mouth feel, aromas, color and flavor. Barrels replaced animal skins for wine about 1,500 years ago. Oak, as a preferred barrel source, is only 1,400 years old. Steve Mayes notes that closed wood containers came into being about 900-800 BC and in the first century BC wine was stored in wood barrels (not necessarily oak and white oak in particular). Most believe white oak for wine storage and aging was a happenstance discovery. As wine making processes were being discovered then refined and studied, it was probably at some point winemakers realized that a certain oak imbued characteristics in wine (red wine in particular) that were appreciated, respected and mystical. Paraphrasing a corporate tagline-The world got better wine through chemistry! Nonetheless, White oak as a winemaking tool is complex and involves science, research, engineering and agriculture. A high quality oak barrel can make up $6.60 of the cost of the bottle of fine wine to the winery. (French Oak is the most expensive at approximately $500 to $750 per barrel.) The barrel better be good because the wine sits in that barrel from 1 to 2 years; depending on what the winemaker is trying to accomplish with the oak. Length of time aging is a function of: varietal wine, the oak of origin being used (France, America, and Hungary), curing methods, toasting method and the desired textures flavors, aromas of the finished wine. I spent many of my formative years in Salem, MO. As some folks say, Salem may not be the edge of the earth but you sure can see the edge from there. I love Salem and the totality of the Ozark’s region where white oak is prolific. Other than being the Gateway to the Ozark’s; Salem produces the finest white oak for wine and whiskey barrels in America. 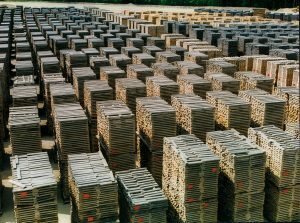 As a young boy I can remember seeing stacks of white oak wood, over the course of 2.5-3 years of curing, that stack of wood would become barrel staves; mostly for whiskey in those days. Since the 50’s much more has been discovered about the science of oak when coming in contact with wine; UC Davis and Iowa State University have been active in oak research, not to mention the cooperage companies doing their own research on oak barrels. A few years ago I did a story featuring a guy who sold wine barrels for Demptos Cooperage in Napa, CA. In one conversation we had he said he was leaving town to visit an oak vendor in Salem, MO. I was shocked to hear him say that and I related the story about my early years growing up in Salem, MO. He was shocked to hear I was familiar with Salem and he went on to say many wineries in the U.S., Chile, Argentina, New Zealand and Australia requested barrels Demptos made using Missouri white oak. I found out from him, that oak from France is different from Missouri oak and even oak from Minnesota and the Appalachian’s; all terroir’s specific to oak. Other companies like TW Boswell, Nadalié, make and ship finished barrels all over the world. With barrels being shipped to wineries all over the world, it is easy to deduce- White Oak should be in short supply. No so; in fact only about 3-5 percent of White Oak harvested in America is used for barrels (whiskey and wine). The White Oak harvested for wine barrels in the Eastern half of the U.S. come from trees that are approximately 125 years old. However, it is economically feasible to harvest White Oak that is 60-200 years old. In the logging industry there is such a thing as a tree being too young or too old for good wood texture. The good thing in America is that the White Oak is so ubiquitous it does not require intensive forest management because of the proliferation in seedlings sprouting once a stand of oak has been thinned out. In France they have very strong regulations for forest management that date back to the 1200’s. “An ironic aside: of all the wonderful wood harvested, 90 percent becomes furniture and other products. The remaining 10 percent goes to barrels,” commented Dr. Tom Cottrell about French White Oak. “The differences in American White Oak and French White Oak are: French Oak contributes to mid-palate or mouth feel of wines and subtly to the nose, while American oak barrels contribute strongly to the aromatics of wine and more subtly to the mouth feel.” In general, the overall benefit of oak is that it is a strong wood that grows straight, which is critical to good quality staves. In addition, the structure of white oak with “tyloses” makes the staves liquid/wine tight. A characteristic of only American Oak. More on tyloses follows. Another benefit to oak barrels is that little oxygen can get to the wine if the barrel is liquid tight. Yes, approximately 5% can be lost through evaporation as the water and ethanol component of wines diffuses through the oak and escapes out as a vapor. Topping off barrels with wine minimizes the effects of oxygen with evaporation-Angels Share; the oak must help take care of God’s Angels. Barrel making, coopering, is an art and science. In summary, what are the benefits of White Oak barrels to wine? · Effectively controls oxidation which decreases the astringency effects, improves color, and highlights to tones of aromas. · Chemical compounds in oak helped with toasting of the oak add texture and flavors-vanilla, tea, tobacco, smoke, and oaky tannins such as wood aromas and mouth feel. There are approximately a dozen cooperages (barrel makers) in the U.S.; half of which are French owned companies and many have a significant presence in Northern California and almost as many are in Kentucky (for obvious reasons). Every cooperage seems to have a different approach to procuring White Oak for their barrels. Some companies go to the source and select the logs from which their staves are cut, while others have long-term contracts with suppliers. Demptos has been buying staves for their accounts exclusively from a source in Cuba, MO. TW Boswell has their own approach to sourcing woods for barrels for each of their locations all over the world. In today’s environment, it would not be unexpected to pay $500 for an American oak barrel or $882 for a French oak barrel (current exchange rates). Hungarian oak barrels would cost about $730. French oak is more expensive for 2 reasons: first, the shipping cost to get the barrels to the U.S., and, the grain structure in French oak means that it the oak must be ‘split’ versus sawn with American oak. Now it gets a little complicated. There are structural tubes that run up the oak at the growth rings. The tubes are called the xylem. These tubes take nutrients up the tree. In French oak the tubes never close up and are open pathways to leak liquid if a solution were not discovered hundreds of years ago. Short answer is, the French oak must be made into staves in such a way as not to expose these tubes. In American oak growths designed by Mother Nature called “tyloses” fill in these tubes at the end of each growing season to make the wood liquid-tight regardless of the way the raw wood is cut. Thus, in French oak the staves must be split in such a way as to not cut through the structurally open ‘tubes’. This process makes for less efficient use of the wood for staves. In a quick survey of wineries that use oak for aging wine, I would estimate approximately 66% of the barrels sold are American oak. But there are still a lot of wine makers that swear by the finesse inherent in French Oak. · In the U.S. there are many species of White Oak and even the region the oak is harvested has a say in how it is used in making fine wine. · How the oak is manufactured makes a huge difference in texture, flavors and aromas. Don’t forget, a huge impact can be experienced between French Oak and American Oak. · Coopers say it makes a difference if a stave is rendered from a log/bolt that is split or sawn. · As a winemaker, it is important to understand how the staves are cured-open air, kiln, moisture applied when needed during open air curing, and even where geographically where cured. Steve Mayes says even the method of bending staves provides important variables. Interestingly, it is not uncommon for a winemaker to specify staves/barrels to be both French oak and American oak to get a profile of the wine that compliments a certain varietal, blend, and terroir. Enough with science: if you are acquiring a more discernible palate for tastes and appreciation for aromas in wine (mostly red’s but some white’s also) you probably have already experienced the affects of White Oak. It is the phenols in oak that affect taste, color, mouth feel and aromas of a nice wine. But, oak aging adds to the cost of that special wine. Traditionally, 60 gallon oak barrels are not used in the fermentation but rather to get distinctive taste and aromas of vanilla, buttery mouth feel. The tannins from oak (as previously noted, are different from the skin of grapes) affect color and texture of wine. Remember, classes of phenols make up more than 200 compounds. For fundamental considerations relating to wine, it is sufficient to recognize them as compounds imparted by oak that work with wine to give wine the distinctive aromas, flavors, colors and textures. Resveratrol is a category of phenol. The affects of oak aging is magical, however oak cannot turn a so-so wine into a great wine. From the harvesting of a 100 year old White Oak tree to a 60 gallon wine barrel for ageing is measured in years not months. That barrel will produce approximately 25 cases of 750 ml bottles of gorgeous wine. In the final analysis it will takes 2.5-3 years to make a barrel from harvest to cooperage and then maybe 2 more years in that barrel before wine is in the bottle. According to TW Boswell, a cooperage firm with offices worldwide, there are approximately 37 staves in a wine barrel and it is not uncommon that it takes 1 White Oak log to make one barrel. To this point we have focused on the White Oak and its impact on making great white and red wines; but mostly reds. There are three processes involved in getting a final stave delivered to the cooperage: the harvesting of the trees by a logging company, the mill evaluating and processing the log relative to several rated characteristics, cutting the quarter sawn American Oak in precise orientation to grain, and curing the cut pieces of oak for ultimate delivery to cooperage companies. Some coopers can look at a barrel and tell you who made it. It is like a DNA, every cooper has a preferred method/process of making barrels. The barrel must be of the right wood and construction because most wineries only use a red wine barrel 2 times and they can never use a barrel used once for red wine for a white wine later. A liquid-tight barrel is worth more than its 120 pounds empty and 600 pound weight full of premium red wine. “There are no amateur coopers, only professional experts,” says Steve Mayes. The Mighty Oak is recognized for strength, versatility, characteristics and complexity that make wine better. King Arthurs Round Table was made from a slab of oak. The oak roots go below ground as far as its branches spread above ground, and it is renowned for medicinal benefits. Guess it has a lot of purposes. Oak is a symbol of Honesty and Integrity; nah, wine is really more than a simple beverage, it keeps company with nobility.